MARDI -- the Mars Descent Imager, the camera I described in great detail in this post -- has already lived up to its promise, and it's hardly begun. Let me set the scene for you briefly. MARDI is a HD color camera bolted to the front left side of the rover, pointed down. It started recording images at a rate of 4.5 frames per second shortly before the heat shield was jettisoned, and shot photos all the way down. The full-resolution images are 1600 by 1200 pixels, and the full video will be breathtaking when it's available. That won't be for a while. 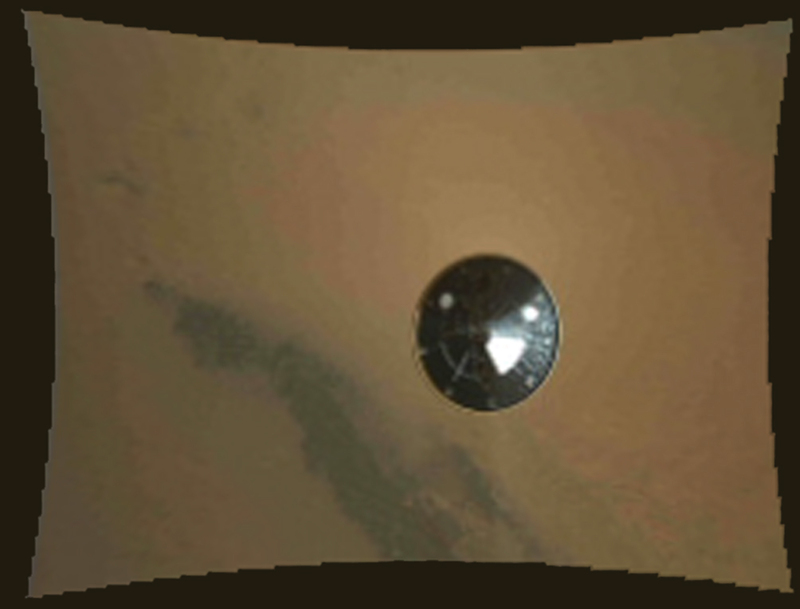 Curiosity sent these thumbnails to Earth in order to give the MARDI team a sense of when the most important images were taken, so that they can make good choices of which full-resolution frames to send first. So the animation will get way, way better than this. It begins with the heat shield about 15 meters below the rover, glinting in the Sun. It falls away quickly, vanishing into invisibility. We see red Mars below it, spinning as the rover spins. At one point there's a sudden change in perspective, likely a result of the "divert maneuver" that Curiosity executed after it cut its connection to its parachute. As Curiosity approaches the ground, we start to see a plume of dust being kicked up. The Skycrane maneuver begins, and simultaneously the wheels deploy; one wheel (the left front, I think) pops into view in one corner. As the rover settles to the ground and the wheels take up its weight, the wheel moves out of the field of view again. I'm not sure I understand why it's called an "animation" instead of a "film". I know it's only a selection of frames, but they add up to a moving picture -- and the motion is not less smooth than that of some of the more undercranked films of the silent era. I can't even begin to imagine how cool the 1600 by 1200 video will be. Simply mindboggling. Yeah - don't quite see why it is an animation. It connotes that it is like a cartoon - which at this resolution, I have to admit, it does kind of seem like it. Nonetheless, very amazing. But I really want to see the 1600 x 1200 video. Wow, Mars landing perfected - even with video. I'm not sure it matters what you call it! When I assemble a stack of still images and make what's effectively a flip-book out of them, that's what I call an animation.